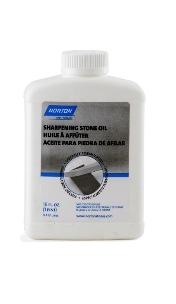 Norton Sharpening Stone Oil is recommended for use in the home, office, factory, and institutions for sharpening operations including all Norton sharpening stones. Also preferred for lubricating hinged or moving parts of hand tools, locks, casters, power tools, mechanical and electrical appliances, sewing machines, sports gear, and hundreds of other applications. Ingredients: Highly refined mineral oil. Contains no animal or fish oil.